I got an email this morning from Glenn Pugh sharing this article, and I wanted to pass it along. I had no idea how bad the Canon, Nikon and Sony counterfeit battery situation was. Be careful when buying “brand name” because you may be buy a total fake. For more info check out this article from The Digital Picture’s website. I can’t speak for other camera batteries but I have found this off brand battery to be the a great compatible chipped LP-E6 battery. Thanks for the heads up Glenn! Chinese companies copying branded products. News at 11. The sad part is sellers (amazon, ebay etc.) are passing these off as genuine and charging almost full price for what is basically the same non branded 3rd party item you can pick up for under 10 bucks… so they’re knowingly ripping people off and amazon etc. just lets it happen. 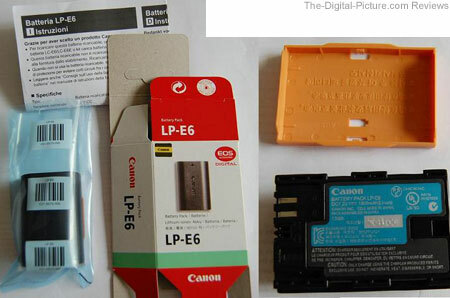 I bought a genuine Canon LP-E8 online at Adorama yesterday for only 5 bucks more than what the fakes are selling for. My amazon.ca seller I was duped into buying from refunded almost all my money and told me to keep the battery. We had alot of timely correspondence back and forth several times over the matter, especially when I left a neutral rating and review of their store, during which they gave me this bs explanation of how a fake battery might have gotten into their inventory by accident (which I obviously wasn’t buying). So I told them the whole matter would be easy to clear up then… just send me the genuine battery after I return the fake one on my own dime even… but send me a picture of the real one first before shipping it because I know what to look for. As I expected, communication abruptly stopped at that point and I never heard from them again. These sellers are perfectly aware of what they are selling. I haven’t even seen what I know to be a genuine Canon LP-E8 on amazon including their international sites. Just read the product reviews. Bottom line is buy from a reputable authorized Canon retailer if you want the genuine OEM product. They aren’t. I made a mistake. They are both chipped and good batteries, but I have more of the Maxtek ones. I changed the link in the other post. Thanks. But if people are LP-EP6 users there are great cheap AND chipped long life batteries available 3rd-party. Ok, so you think the Maximals are ok? Because I bought four of them based upon your other recommendation. Should I return them for the Maxtechs or just give them a go? In your opinion. Yes they are fine. There pretty much the same battery on different brands.